Sharon Carver, teaching professor of psychology and director of the Carnegie Mellon University Children's School, has been named the winner of the 2010-2011 Elliott Dunlap Smith Award for Distinguished Teaching and Educational Service in H&SS. "Sharon Carver represents the ideal Carnegie Mellon professor," said John Lehoczky, dean of the College of Humanities and Social Sciences. "She is a major national researcher in child development and child education. She is a brilliant, well-organized classroom teacher, and in both large and small classes, she is devoted to all of her students and their learning." Carver, who received her Ph.D. in cognitive psychology from CMU in 1986, joined CMU's faculty in 1993 as a member of the psychology department and director of the Children's School. As a teacher, Carver is known as an outstanding course designer and classroom instructor. Her hallmarks are extraordinary dedication to fostering the learning of each individual student and drawing on her extensive expertise and research in cognitive development and learning sciences and applying it to everyday interaction with students. She is vigilant about making herself available to meet individually with students outside of class, both to stay on track in class and in their overall CMU experience. Carver has also masterfully filled the challenging role of director of CMU's Children's School, where she mentors a small army of children ages 3-5, as well as preschool teachers, staff, undergraduate students working in the school and parents. Moreover, she is the associate director of the Program for Interdisciplinary Education and Research (PIER) - an interdepartmental graduate training program funded by the U.S. Department of Education. Carver has had and continues to have a profound impact on the lives of countless children, staff, undergraduates and graduate students of all ages and skill levels at Carnegie Mellon. Her impact is even felt at the wider community and national level. For example, Carver has acted as coordinator of communication and technology for the International Association of Laboratory and University-Affiliated Schools and was recently re-elected to the board of the Pittsburgh Association for the Education of Young Children. In 2009, she was selected to serve on the board of the National Coalition of Campus Children's Centers. According to Carver's nominators, she is so motivating to be around largely because she loves what she does in all of her educational roles. This, they noted, is "one of the reasons she is not only the best at what she does, but also an inspiration to students and to her colleagues." 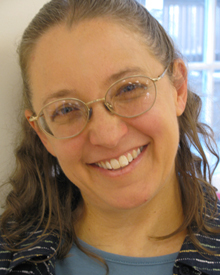 For more information about Sharon Carver, visit http://www.cmu.edu/dietrich/psychology/people/core-training-faculty/carver-sharon.html.